Gastric (stomach) and esophageal cancers are amongst the most challenging to manage. The most important first step is to make the proper diagnosis, since the treatments for gastric and esophageal cancers are very different. It can be difficult to tell gastric (stomach) and esophageal cancer apart, especially when tumors arise from the lower esophagus or upper stomach. Indeed, many upper gastric cancers behave like esophageal cancers and should be treated as such. Because of the complexities associated with treatment these cancers, it is critical that patients seek care at hospitals with the highest level of clinical expertise. 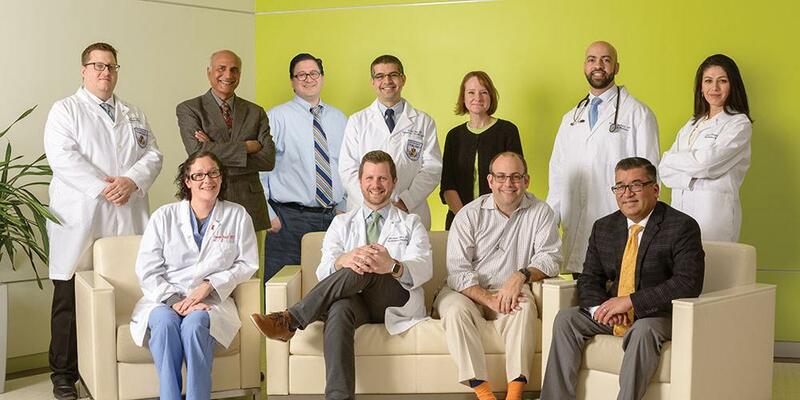 As the region’s only Commission on Cancer accredited Cancer Cancer, our foregut (esophageal and gastric) cancer program is staffed with expert physicians who have trained and worked at some of the top cancer programs in the country. Each patient gets a thorough review to ensure that the proper cancer diagnosis is made. All cases are discussed in a multidisciplinary setting and given an individualized treatment plan. The ideal treatment strategy for either cancer can vary widely from individual to individual based on a number of factors (tumor size, location, biologic features, and extent of disease). We also offer enrollment in state of art clinical trials for eligible patients. Furthermore, with the assistance of dedicated nurse navigators, we work closely to coordinate care with referring physicians (even those who are far away) to allow for some elements of treatment to be given close to a patient’s home without compromising the quality of care. This relieves the burden of patients having to schedule visits or keep track of care plans with multiple providers. Our team does the work for them, allowing the patients to focus only on recovering. In order to seek a consultation, patients with a suspected diagnosis of esophageal cancer can be referred to the thoracic oncology program (315 464-6257), and cancers arising from the stomach can be referred to the surgical oncology program (315 464-6297). Regardless of where the patient is referred, we will perform a comprehensive multidisciplinary clinical review to ensure the correct diagnosis has been established and the proper care plans are formulated.